To accept payments via Virtuous Giving, you'll need to create a merchant account with WePay, the processor who will actually handle all credit card data and transactions. A merchant account is a specific type of bank account that allows a merchant acquiring bank to authorize and accept electronic payments for your organization. The process be completed in its entirety in one sitting. Since setup involves connecting to WePay and configuring your new account, it's generally best to complete the whole process to ensure your account is configured correctly. The setup should be completed by your controller or CFO. WePay accounts are tied to a specific user, who should be the person responsible for managing your organization's bank account. To begin setup, navigate to the Giving page in Virtuous Marketing. 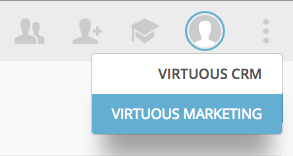 To access Virtuous Marketing, look for the three dots in the upper-right corner of the screen, and click to switch from Virtuous CRM to Virtuous Marketing. Once in Marketing, look for the Giving option in the left-side menu. 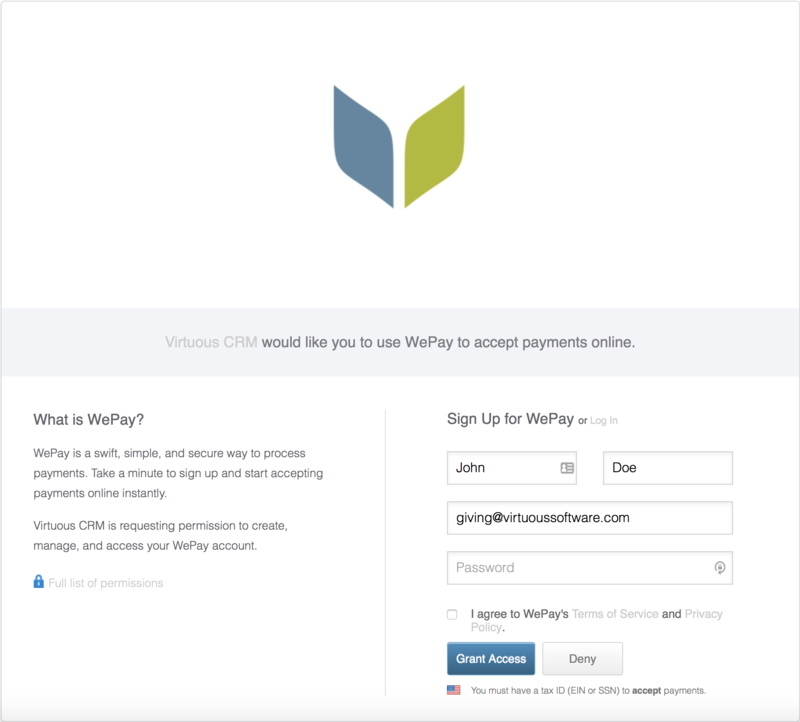 If you've never used WePay before, or if you've never even heard of WePay before, that's OK! When you begin the setup process, you'll be prompted to create a login. Just click "Create My Account" and you'll be taken to a screen to set up your WePay username and password. If you already have a WePay account, you can use your existing login. This login will be stored as part of your Virtuous login; once entered, you will not need to log in to WePay again. Full Name: Your first name and last name. This should match the first and last name of the WePay user account. Email: The email address for the main user. Again, this should match the email address for the WePay user account. Phone: The contact number for the main Virtuous Giving user. Organization Name: The account name for your nonprofit (see below for more). Organization Description: A brief description of your nonprofit/mission. Organization URL: The link for your main website. Address Line 1: The street address for your nonprofit. Address Line 2: The street address for your nonprofit, continued. City: The city of your nonprofit. State: The state of your nonprofit. Postal Code: The zip or postal code for your nonprofit. When entering a name for your organization, keep in mind that the first 16 characters of your merchant account name will appear on your donors’ credit card statements, so be as clear and concise as possible. It’s best to limit your account name to letters and spacesonly (no emoji, no matter how hip your organization is). There are three key phases to the WePay account approval, one of which verifies the personal information for your main account point of contact, and another which verifies your organization's information. The third phase involves connecting your merchant account to your bank account and specifying your preferences for receiving your payments. You can learn more about WePay's requirements for using your social security number in this support article. Once you have completed your WePay account setup, you are almost ready! Now, you'll just need to configure your donor portal. For that, you can check out our article on Managing Your Donor Portal.